Audio entry kit based on the 8000 Series modular design incorporating two way speech, electronic cal.. 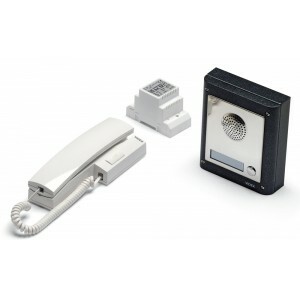 This 8000 series audio 1 button kit allows calls to be answered on a standard B.T. type telephone re.. The Stylish Videx 8K1S/380 is aesthetically pleasing which will look good on any building. The 8K1S/..
- 1-10 Buttons GSM flush intercom kit including 13Vdc PSU and antenna.- Intercom panel in the 40..
- 1 -10 call buttons surface mount GSM intercom kit including 13Vdc PSU and antenna.- Intercom p..
- 1 -10 Buttons surface GSM intercom kit including 13Vdc PSU and antenna.- Intercom panel in the..
- 1 -10 Button flush GSM flush mount intercom kit with Code Lock including 13Vdc PSU and antenna. ..
- Vandal resistant GSM technology door panel with speak and open LED's.- Available in both surfa..